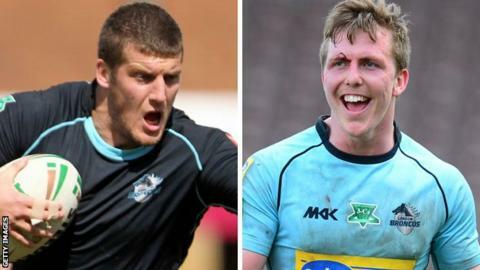 Tony Clubb and Dan Sarginson both scored twice against their former club as Wigan overcame a bad start to beat winless London Broncos comfortably. Iain Thornley also scored twice as the champions ran in seven tries, Matty Bowen also getting on the scoresheet. Jamie O'Callaghan and Mike McMeeken both crossed inside the first eight minutes to raise hopes of a shock. But Wigan were ahead by half-time and never looked back, despite a late try from Illiess Macani for the Broncos. Their eighth consecutive defeat leaves them still without a point this season, but one place off the bottom thanks to Bradford's pre-season points deduction. Wigan, meanwhile, are up to fourth in Super League and lie six points behind leaders St Helens, who they face in their next outing at Langtree Park on 18 April. "I was never nervous, a bit annoyed maybe. I was upset wanting half-time to come so I could say my bit. I thought we would always win but they put in a very spirited performance and ran hard. "I have watched all their games this season and that is the best they have played this year. We need to get used to the fact that people are going to come here and raise their game because they are playing against the double winners. That is what London did and I don't think we were ready for it. "We were worthy winners but there were parts of the first half I was really disappointed with. I know what it's like as a player in those type of games and you need to show respect because Super League is very competitive and, if you don't turn up with the right attitude, you will get burned. "We were outrageously gutsy and sensational. We were wonderful. We really took the game to them at the start. "We came up here and really went at the contest. If there is a negative we made too many errors in our own end and we just needed to stay tidy in the middle block. "We have been building and every game is important to us. I do expect good things for the rest of the season." Wigan Warriors: Bowen; Burgess, Goulding, Thornley, Sarginson; Green, Williams; Taylor, McIlorum, Dudson, Clubb, Bateman, O'Loughlin. Replacements: Hughes, James, Powell, Pettybourne. London Broncos: Solomona; Macani, Caton-Brown, Minns, O'Callaghan; Farrar, Drinkwater; Krasniqi, Moore, Greenwood, Vea, McMeeken, Foster. Replacements: Mataitonga, Cook, Wallace, Cunningham.